There was a time when no gamer would touch an all-in-one PC. The inferior hardware that used to be the norm in AIOs meant that they weren’t suitable for running modern games, and it was usually the case that they couldn’t be upgraded. In recent times, however, an increasing number of manufacturers have been creating AIOs with performance that can match or even exceed their traditional tower machine counterparts. The latest being boutique PC maker Maingear, which just unveiled the incredible Alpha 34 at CES – the world’s first AIO to offer 8-core Intel Extreme Edition and 18-core Xeon processor options. The highly customizable Alpha 34 comes with a curved 34-inch display with a 3440 X 1440 resolution. It uses a standard mini-ITX motherboard, with ASUS ROG Maximus VIII Impact and ASRock X99E-ITX MOBO options in the high-end configurations. Being able to select your own motherboard means the system can use either socket 1151 or socket 2011-3 CPUs, including Intel's Core i3/i5/i7, or Intel Xeon E5 v3 processors with up to 18 cores and up to 45MB of cache. There’s also the option to include Maingear’s own closed-loop liquid cooling setup to keep all that premium hardware cool. On the graphics card front, the Alpha 34 can accommodate full-sized desktop cards such as the NVIDIA GeForce GTX Titan X, the AMD Radeon R9 Nano, or professional GPUs like the AMD FirePro W9100 or Nvidia Quadro M6000. The Alpha can also hold up to 32GB of unbuffered DDR4 memory, a Samsung 950 Pro M.2 NVME SSD and up to two 2.5” storage devices. "The superb combination of Intel’s blazing fast processors with state of the art graphic cards and an astounding screen, gives Alpha 34 the muscle to handle any task while being the centerpiece in every room," says Wallace Santos, CEO and Founder of Maingear. "Alpha 34 is a super stocked modern dream car with old-fashioned muscle under the hood that is perfect for gaming, movie watching or even designing in Adobe’s Creative Suite." This kind of system doesn’t come cheap, of course. The minimum-spec Alpha 34, which costs $1999, comes with an Intel Core i3-6100, a Gigabyte GA-Z170N-Gaming-5 motherboard, 8GB of Kingston HyperX Fury DDR4-2666 RAM, an AMD Radeon R7 360X graphics card, 1TB HDD (7,200 RPM), 8X DVD burner, and Windows 10 Home 64-bit. If you want something a lot meatier, then a liquid-cooled Alpha 34 with an eight-core CPU, 1TB SSD and a Titan X will set you back around $4771, with the top-end workstation version costing about $15,000. 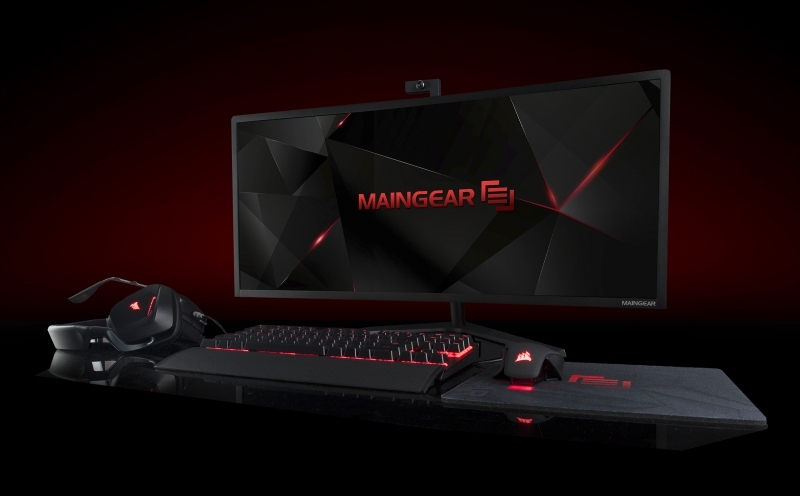 And if you don’t like that black finish then Maingear is willing to offer the Alpha in a range of alternative colors – for an extra $299 to $399.